"This Librarian has been on a quest for 20 years to find junk-free reading for his children." I have filled this book with over 500 wholesome, fun, and educational books for your kids! 510 great children's books recommended; 411 of these titles are annotated. Gift recommendations ... for every age child. Books that teach life lessons ... about hard work, laziness, selfishness, generosity, honesty, serving others, being yourself, perseverance, sacrifice, faith, consequences, judging by outward appearance, and much more. 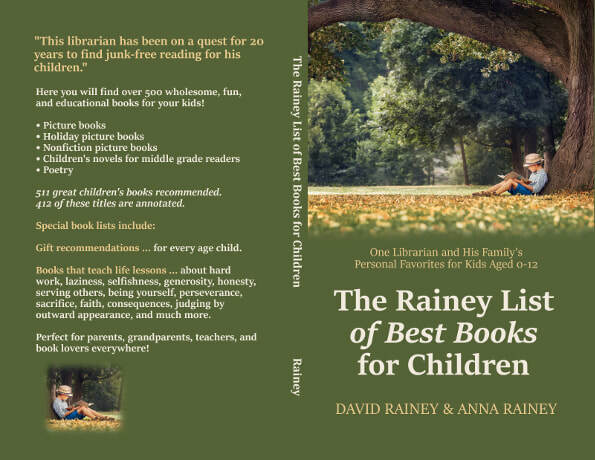 Perfect for parents, grandparents, teachers, and book lovers everywhere! The paperback copy is available on Amazon.com for $11.95. Soon an ebook version will also be available. David is married to Tonja. They have three wonderful daughters. David is a librarian and writer in Baton Rouge, Louisiana. His previous bibliography is Faith Reads: A Selective Guide to Christian Nonfiction (Libraries Unlimited, 2008). David is also the author of Restoring Reality: Exposing Modernism to Recover a Christian Worldview (CreateSpace, 2014). Anna has always been surrounded by books. Her parents instilled a love for reading, writing, and learning in her and her siblings by reading to her each night. She has been homeschooled all of her life and is now a senior in high school. Anna is also very passionate about theatre. She has performed in many musicals in her community and seeks to worship God through her singing, acting, and dancing.